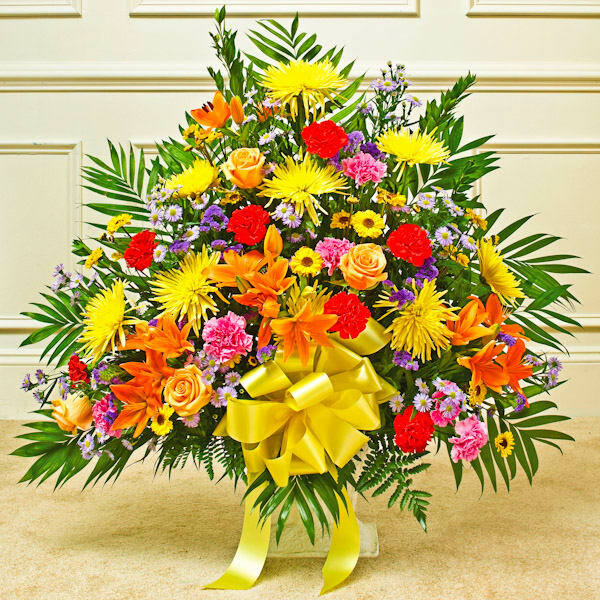 Send a beautiful expression of your love and support during this difficult time with an arrangement of elegant bright blooms. • Features fresh bright-colored roses, mums, lilies, poms, carnations, statice and more. • Usually sent by family, friends or business associates. • Delivered directly to the funeral home. Having family scattered over several states, the convenience of being able to do this on the webpage was such a blessing. The flowers arrived in a timely fashion even though ordered less than 24 hours before. They were beautiful and just the right touch. Thank you so much! The flowers that were delivered were exactly as pictured. Offsetting the usual sad mood of a funeral or memorial service, the bright, lively colors of this floor basket generate a certain joy to comfort friends and loved ones left behind. The pinks, yellows and reds emanate the often hidden message of Universe--the essence that life is vibrant and eternal. 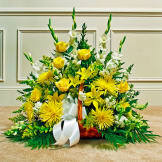 We recently placed an order and it was delivered on Wednesday to the family of our coworker who lost his brother. In the past we have used one of the usual online 1800-flowers kinds of places, and we have been less than pleased. Your site was listed on the funeral home's website, so we used you. 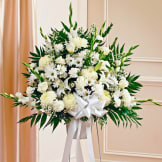 The family told us that your flowers were the most beautiful they had ever seen and the arrangement was HUGE. I was so thrilled to hear this, because you never know what you are going to get when you order flowers online - you just cross your fingers and hope for the best! Anyway, I just wanted to express my gratitude. Good work! Emily H.